This book is a companion text for “Essential EU Law in Charts”. Together with the charts, the book is intended as a learning tool for students as well as for practitioners endeavouring to brush up on their EU law skills, especially in view of the Lisbon revision and the fundamental changes that it brought about in the EU legal system. The book contains a brief and simple text on the matters dealt with in the charts book and with references to the charts. 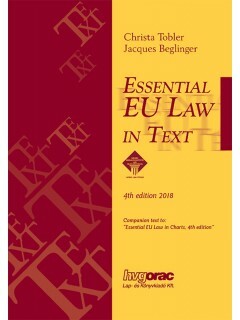 It deals with the following issues: introduction to the subject, the development of European integration, the institutions, competences of the EU, the adoption of secondary measures, the nature of EU law, introduction to substantive EU law, the internal market, competition law, social law, legal integration and enforcement. Christa Tobler is a professor at both the Universities of Leiden (the Netherlands) and of Basel (Switzerland), where she teaches EU law. In her research, she places a particular emphasis on the issues of legal equality and discrimination, both in economic and in social law, as well as on the legal relationship between Switzerland and the European Union.